Cryptocurrency is the “in” thing in tech and everybody’s falling over one another to join the bandwagon. Kodak is now the latest addition to the ever-growing list of companies, governments and NGOs by announcing KodakCoin. 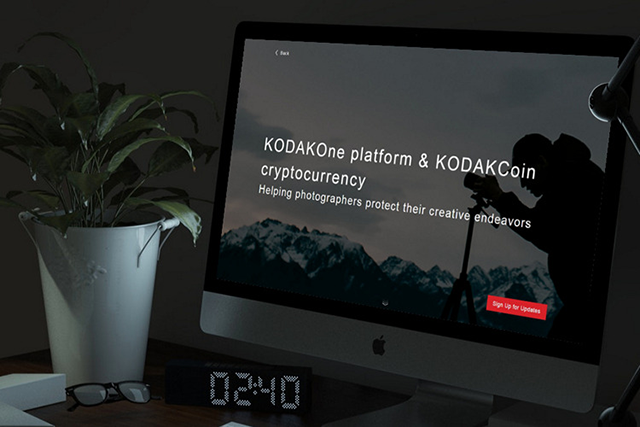 On its website, the company described KodakCoin as a platform that “allows participating photographers to take part in a new economy for photography, receive payment for licensing their work immediately upon sale, and sell their work confidently on a secure blockchain platform.” That buzzword-filled statement sure made investors happy! Kodak’s stocks more than doubled after the announcement, hitting $7.47 after having opened at $3.10 in the morning. The company also announced a partnership with London-based Wenn Media Group to carry out the initial coin offering (ICO). Kodak is also launching an image rights management software called “KodakOne” that will crawl the web to find photographs that have been used without permission. Once the original copyright-holder is identified, the offending publication will have to pay up in KodakCoin, of course. According to Kodak CEO Jeff Clarke, “Kodak has always sought to democratise photography and make licensing fair to artists”. Curiously enough, Kodak is also planning to start commercial Bitcoin mining operations soon, and towards that end, will install Bitcoin mining rigs at its headquarters in Rochester, New York. The “KashMiner” operation will be run by a licensee called Spotlite that had earlier teamed up with Kodak to market LED lights. Kodak says that Bitcoins generated by KashMiner will be shared between the customer and the business. With digital currencies taking the world by storm, even the ones that started off as jokes, are hitting astronomic valuations with investors lapping up anything and everything related to blockchains. The phenomenon hit the mainstream late last year with the start of Bitcoin Futures trading on the Chicago Board Options Exchange (CBOE), and while the valuation of the grand old cryptocurrency has since started thawing, it’s altcoins like Ripple, Dogecoin and IOTA that are having their moment in the sun.